What's that? You want to ditch annoying direct mail and cold calls?! You want to focus on driving quality traffic to your website to increase RFQs!?!? You're making a smart adjustment to your marketing strategy that aligns with how B2B buyers buy today. You now face a common dilemma: picking the best tactic to drive traffic and increase RFQs. Today we're looking at two heavy hitters in B2B marketing: PPC vs. SEO. You might be saying, "Whoa there marketing guy... what the heck are PPC and SEO?" Here are the Cliff's Notes for each. PPC or pay-per-click is a search engine-based advertising method. You select a set of keywords, and your website will show up for those searches. PPC can also be done through social media websites like Facebook, Twitter and LinkedIN. As the name implies, you pay a fee when someone clicks on your ad. The price you pay per click is determined through an auction system where businesses bid against each other for that keyword. The highest bidder ranks first, the second highest ranks second, and so on. As you'll notice in the search results above, the first four listings are all PPC ads. The ones without the green 'Ad' designation are all "organic" listings that appear through SEO. SEO, or search engine optimization, increases the number of visitors to a website through organic search results. In other words, pages of your website will show up in Google, ideally on page one, without paying for clicks. Now, which is better for increasing RFQs? One of the biggest determining factors is your urgency. Are you WAY behind your sales targets for the year, quarter, or month? Are you looking to ramp up in the next 6-12 months? This will dictate whether PPC or SEO is your best option. PPC has an immediate impact on your traffic and position. 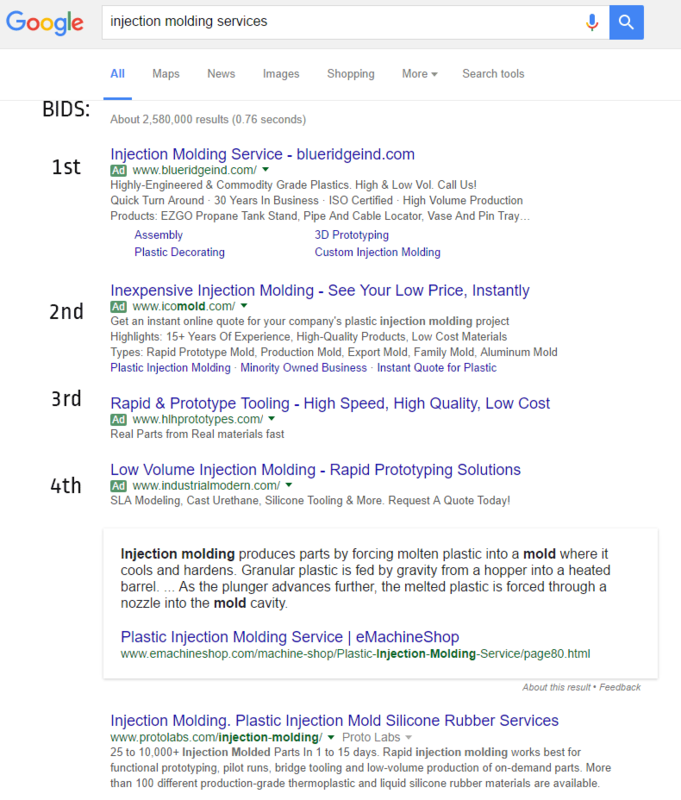 You can go from being buried on page 100 of the search results for 'injection molding services' to the top of page one in a matter of minutes. SEO simply cannot compete with PPC's immediate results. However, that speed comes with a price. More on cost/budget below. *One caveat with PPC - If your site is already SEO friendly and you rank high in Google for your keyword, it may be better to focus on content production/SEO. This is especially true if the cost per click (CPC) is really high. One challenge with SEO is that it's not immediately effective. It takes a little time for Google to acknowledge your site's SEO improvements and rank you better. You may need to produce keyword content regularly for the next 6-12 months, but once you start to rank well for the desired keyword, the effects are long-lasting. This means you own the marketing position versus renting it with PPC. The biggest benefit is that you won't have to pay every time someone clicks your organic search result. This increases your marketing ROI significantly. As with any marketing tactic, your budget has a big impact on your strategy. First, let's be clear: whether you invest time or money, you're going to invest something. You have to decide whether to your time or your money is more important. 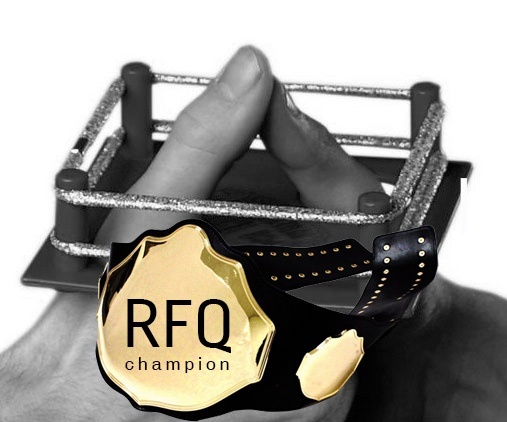 The key with both options is to understand what you need from new RFQs and sales to achieve a positive ROI. Opting for PPC means you're able to invest in ad-spend budget monthly. You will be constantly renting space at the top of results. This is renting ad space on a billboard, but the people seeing the ad are actually looking for it instead of being exposed to it against their will. Prioritizing monthly PPC requires careful budgeting. Your budget needs to be secure if you want to see a consistent stream of RFQs. If you are willing and able to do SEO yourself, you should do SEO. Additionally, if you have a marketing budget, you can hire professional SEO services rather than investing in PPC. The benefit to SEO vs. PPC here is when you rank for keywords, you will grow your RFQ traffic without constantly paying for it. You own versus rent the space in the search results. This allows you to focus on other keywords, and increase your overall SEO impact. Generally, if you have a smaller budget, you're better off going with SEO. Competing for search engine rank is much different than competing offline for market share. Online, your business competes against the likes of Wikipedia, experienced industry bloggers, and your direct competitors. With SEO, some keywords are harder to rank for than others. Some keywords simply impossible to rank for. Competition is a variable that can make success difficult no matter which tactic you use. For instance, it might be hard to rank for "metal manufacturer." There are many metal manufacturers fighting over that keyword. In this case, it might be more effective to use PPC to rent a top position - IF you feel it will increase quality RFQs and produce a positive return on your investment. On the flip side, if your keyword is not super competitive (calling all niche keywords), you may want to use PPC as a supplement while you work towards organic SEO rankings. A long-tail alternative keyword for "metal manufacturer" might be "tractor component powdered metal manufacturer." This is a very niche keyword that will have much less competition. That means your cost per click will be less, thus making ROI more realistic. When the competition for a keyword is weak, it's often better to pursue organic rank with SEO. Even if the term is cheap to buy with PPC, in the long run, it will be significantly cheaper to rank organically. This means your cost-per-RFQ is much cheaper. Plus, less competitive keywords often provide results much more quickly. Step one of successful marketing: identifying your target market, AKA best buyer, AKA buyer persona. Your persona should be clearly defined to make sure you're showing up where and when they're looking. One of the biggest advantages to PPC is precise audience targeting. If you know that your buyer persona is male, 30-50 years of age, in one of five big cities in the US, you can greatly reduce your CPC. You'll also eliminate unqualified click-throughs from people who don't fit your parameters. PPC ads in social channels offer even more targeting options. This level of targeting simply cannot be done with organic SEO. If you don't need to trim your audience to a very small geographic region or demographic profile, SEO will work perfectly. Organic listings can't be limited by these targeting criteria for broad keywords. With SEO, you could focus on keywords that include locations and other qualifying criteria. However, that won't stop someone outside of the criteria from clicking through to your site. Personally? As a business owner, I would use a combination of the two. For keywords that will have a big impact on RFQs but will take a while to rank organically, I would invest in PPC while SEO is still in progress. Likewise, for highly competitive keywords that can achieve higher ROI, I'd invest in PPC while also working on SEO. For best results, PPC should be used to supplement your SEO activities. If I have my choice, I would rank organically with SEO 100% of the time. It has the best ROI and long-term benefit. Unfortunately, urgency, budget, competition, and targeting don't always allow for SEO's slow burn.